While I and many people face our own personal health battles, a young man wasn’t even given a chance to fight more than a few days. Today Australian Test cricketer Phillip Huges passed away – two days after being struck in the head by a bouncer from bowler Sean Abbott. There is no blame here. Twenty-five-year-old Hughes, short in stature and wearing a helmet, turned a bit too far in front of the oncoming ball and it hit him on the neck/back of his head. He stumbled but was quickly brought to the ground and never regained consciousness. The cruel blow was rare – an incident believed to have only been reported once before involving a cricket ball. A cruel, cruel accident that has changed the lives of two families immediately, not to mention those of the teammates and friends of those two men – Phillip and Sean. Phillips’s family is left to grieve a young man who was still determined to fight his way back into the Australian Test team – a situation he had become accustomed to having been dropped about three times from the team. He was 63 not out playing for South Australia against his old team NSW at the SCG when the fatal blow was dealt. Sean and his family are left to grieve his lost innocence. 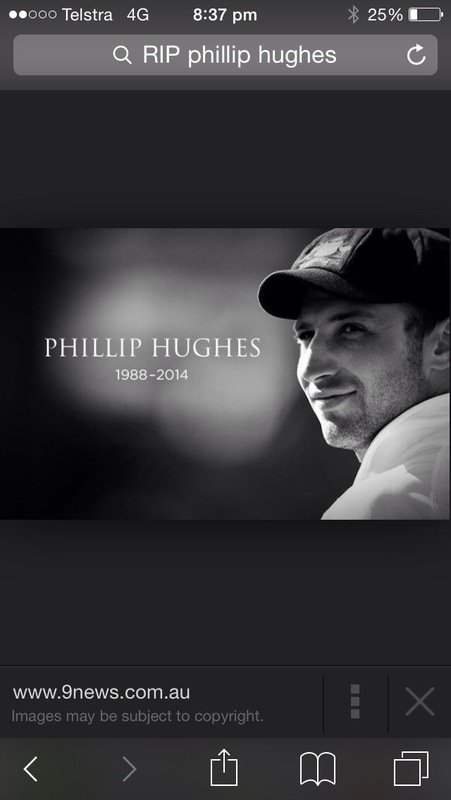 For the rest of his life he will be the man who delivered the ball that killed Phillip Hughes. It wasn’t his intention. Sure he would have been trying to rattle the batsman – as all fast bowlers do – but to cause that kind of damage – no, no that wasn’t his intention. I’m not taking anything away from the fight people like me are involved in now – I am fighting for my life – but this young man didn’t have a chance to fight for his life – it was taken from him way too early. No chance to have a family of his own, to further his career in the game that brought him from the country to the city and in the game that he used to generate a huge amount of respect from those who knew him best and those who, like me, admired his tenacity to get back up every time he got knocked down.